This AF-100 antenna eﬃciently transmits and receives signals reﬂected back to Earth without tuning. Its two dipole elements, mounted at right angles to each other, allow scientists to characterize the returned signal. One of the longest-standing programs at Southwest Research Institute is our research in radio frequency surveillance and communications intelligence. Working with software and automated systems engineers, signals intelligence specialists help the U.S. and allied militaries meet the latest information processing demands while addressing cyber warfare threats. In 2018, SwRI added new radar and geolocation capabilities. Meanwhile, in an environment of increased wireless complexity and interoperability, we anticipate increased demand for autonomy, standardized architectures and hardware/software services for our clients. Building on decades of work with shipboard and ground-based systems, engineers completed internally funded research programs in space and near-space sensors that resulted in two externally funded projects. Engineers ported SwRI’s signals intelligence software to ruggedized hardware meeting new OpenVPX defense department interoperability standards. We evaluated the resulting digitized radio frequency recording system on board a stratospheric balloon. SwRI developed the Time Varying Spatial Correlation algorithm and assessed how accurately it locates priority RF signals from a space platform. Other programs led to launching a second ionospheric sounding facility on our San Antonio grounds. The facility provides precision ground-based measurement of ionospheric conditions, an improvement over launching instruments into near space via sounding rockets. With a smaller footprint than rocket launch sites, the facility also allows longer-duration studies than the minutes of data collected before rockets fall back to Earth. In 2018, SwRI delivered advanced communications intelligence (COMINT) technology to U.S. Navy and allied clients. 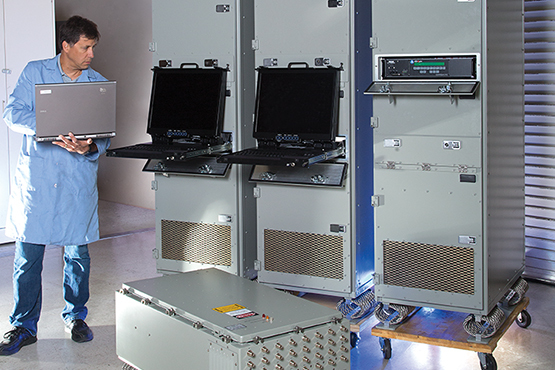 The system includes an array of above and below-decks hardware and software to meet growing COMINT demands. 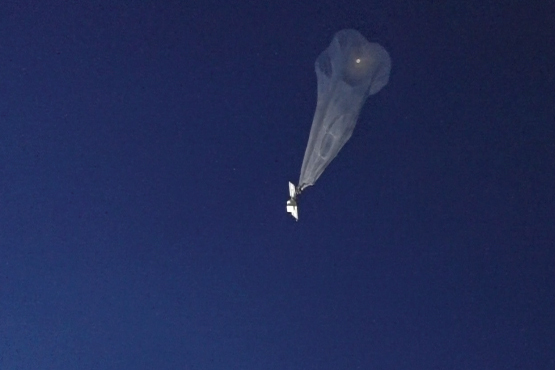 SwRI engineers used OpenVPX processing hardware to support a digitized radio frequency recording system evaluated on a stratospheric balloon. OpenVPX is a set of defense industry interoperability specifications. In related research, engineers are using our AF-100 antenna for a novel, SwRI-developed VIS-3000 sounder system. Sounders, or ionosondes, use radar techniques to measure the virtual height of the ionosphere, which reflects high-frequency radio communication signals back to Earth for beyond-line-of-sight communications. Typical sounders require 200 to 300 watts to make these measurements, but the VIS-3000 sounder uses as little as one milliwatt to do the job. In 2018, SwRI also explored a new area of signal intelligence research known as “geofencing,” which collects and analyzes radio frequency energy from a defined area to identify the signal source and location precisely. Our office in Warner Robins, Georgia, serves the aerospace and defense communities with a wide array of capabilities and expertise in avionics, electronic warfare, instrumentation, software and systems engineering and continues expanding these capabilities to new platforms. Aerospace electronics and software engineers from across the Institute are collaborating to develop a new sensor integration unit for the U.S. Air Force fleet of F-16 Fighting Falcon aircraft. The unit collects and correlates data from a number of sensors to provide Air Force pilots with improved situational awareness via a single integrated display. This year, we received certification to AS9100:2016, a quality management system for the aerospace industry developed by SAE International in collaboration with the European Association of Aerospace Industries. To meet the challenges of the changing global business landscape, we are adopting the latest Capability Maturity Model Integration Institute quality system, CMMI® Development 2.0. For more information visit defense.swri.org or contact Vice President Nils Smith, P.E. via email or call +1 210 522 3685.